Steve Jones, research associate professor of natural resources and the environment and a water quality specialist, samples Great Bay with Ph.D. student Meg Hartwick. Consider the gifts of the oyster. The humble mollusk gives us slurpworthy dining pleasure and cleaner water, thanks to each oyster’s filtering of up to 40 gallons of water daily. Locally, it’s launched a growing aquaculture industry in Great Bay. But the oyster can also give a gift that makes us wish we’d never considered the mollusk: Vibriosis, an illness that causes both gastrointestinal distress and, most likely, a lifelong aversion to the briny bivalve. Now, as incidences of Vibriosis rise sharply in the Northeast, an interdisciplinary team of researchers at UNH are bringing science to the shellfish industry to stop the food-borne illness before it makes it to the halfshell. We get sick when oysters – commonly eaten raw -- are contaminated with a pathogenic strain of a ubiquitous, fast-growing group of bacteria called Vibrio, in particular, the species of Vibrio called parahaemolyticus. As our appetite for oysters – particularly in the warm summer months – has increased and water temperatures have risen due to climate change, incidences of Vibriosis have also gone up. So have closures of shellfish beds: 2013 saw a jump in both Vibriosis and an unprecedented level of shellfish bed closures in Massachusetts and Connecticut. For the three-year study, funded by the National Science Foundation through NH EPSCoR, Jones is working with Vaughn Cooper and Cheryl Whistler, both associate professors of microbiology, and Tom Safford, associate professor of sociology. With Great Bay and its 10 commercial oyster farms as their laboratory, they’re attacking illness-producing Vibrios on many fronts. 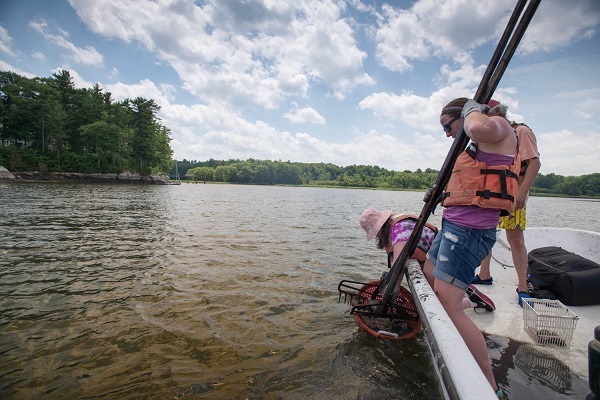 In Great Bay, a team of undergraduate and graduate students collect oysters to look at environmental conditions that might favor Vibrio parahaemolyticus. Jones, a water quality specialist, and a team of undergraduate and graduate students are looking at environmental conditions that favor Vibrio parahaemolyticus, warmer water due to climate change chief among them. Salinity – which decreases during unusually heavy rainstorms – pH levels, dissolved oxygen, and turbidity are also on the researchers’ radar. Working out of UNH’s Jackson Estuarine Laboratory at Adams Point in Durham, Jones is drawing on a deep dataset of Great Bay and Oyster River conditions, which UNH scientists have been monitoring for nearly a decade. Back in the lab, microbiologists Cooper and Whistler use population genetics and latest genomic techniques to determine which strains of Vibrio parahaemolyticus are making people sick and whether they’re coming from somewhere else or evolving here in Great Bay to become pathogenic. They’re also probing the dynamics of environmental factors as they interact with other microbes within the oyster on pathogenic Vibrios. And how to convey this cutting-edge scientists to shellfish growers and eaters? That's where Safford comes in. Looking at survey data, he’s interested teasing out how the general public trusts and believes scientists, information the researchers hope will ensure better reception of cautionary information about outbreaks of Vibriosis. These four UNH researchers are part of a larger team that includes oyster farmers and university scientists from New Hampshire and Maine. Under the umbrella of the New England Sustainability Consortium (NEST), a project of Maine and New Hampshire EPSCoR, the collaboration aims to bring an interdisciplinary approach to coastal sustainability. And while each partner brings a unique skill to the raw bar, they’re aligned in the ultimate goal: To keep oyster lovers healthy by keeping Vibrios off the menu. In addition to NH EPSCoR funding through the National Science Foundation, this work has received funding from NH Sea Grant and the NH Agricultural Experiment Station. Read more about this work.